“The City University of New York is reaching a breaking point—in large part because the normal costs of doing business are not covered in the State’s annual budget allocation to the University. The current funding model for CUNY, even with the present MOE in place, is unsustainable. It forces the University either to cut existing academic programs to make up for the budget shortfall or to rely on huge numbers of low-wage workers as instructors or to escalate the pace of tuition and fee increases (thereby also enlarging the unfunded TAP gap) simply to stay afloat. 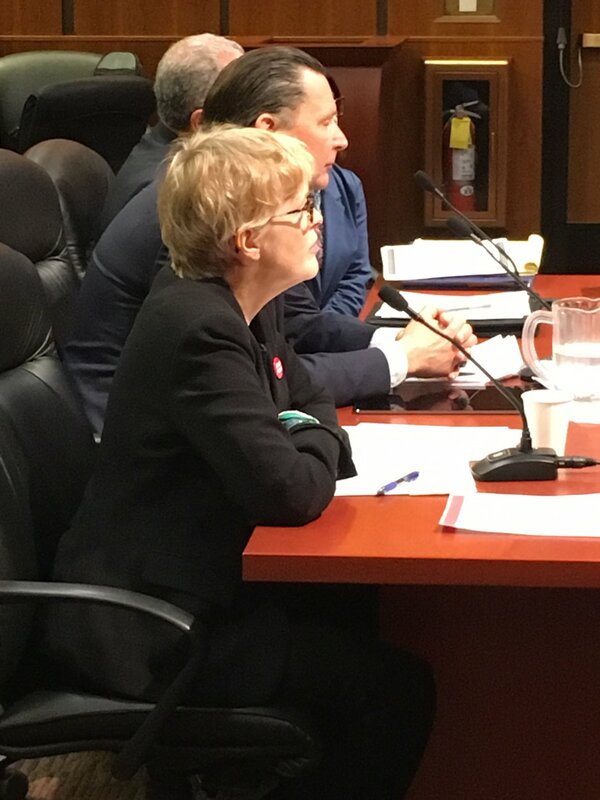 In the absence of a full MOE, CUNY is being forced to cannibalize its own inadequate budget to cover costs that should be automatically funded by New York State,” she testified. The enhanced Maintenance of Effort bill sponsored by Assemblymember Deborah Glick and Senator Ken LAValle would provide State funding for all annual mandatory cost increases, including rent, energy bills, collective bargaining increases and the TAP waiver credit. Versions of the bill have passed the Legislature three times with overwhelming bi-partisan support, but have been vetoed twice. The PSC believes this is the year to address underfunding of CUNY. “New York State is in the midst of an historic political shift. The change in control of the Senate means the Legislature will be much different next year. Voters are turning out in elections and demanding more of the lawmakers who represent them. Now, when much of the nation is looking to New York for proven progressive leadership, it’s time to make investments in the public good a priority,” said Bowen.